Portland Menstrual Society believes that every person who experiences their period deserves access to safe restrooms and free menstrual resources. Currently there are no menstrual supplies available on campus. Lack of these basic resources leave students with little options except to miss class or stay home in order to feel safe during their period. 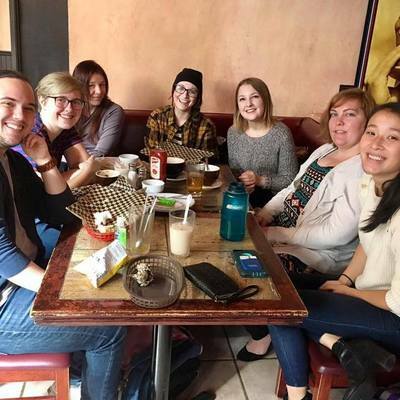 Our student organization focuses on breaking the stigma surrounding menstruation on the Portland State University campus in order to advocate for all students to have access to inclusive, accessible safe restroom facilities and free menstrual hygiene supplies. These students are especially in need of our support with the removal of Federal Restroom Protections for Transgender citizens, regulations that had previously allowed trans students to use any restroom they identified with. Though PSU has committed to keeping these protections in place, hate speech has been found in several restrooms on campus, while numerous gender neutral restrooms on campus remain locked, leaving the trans population weary of using facilities on campus, especially those who experience menstruation. PMS is currently working on a student initiative for Free menstrual hygiene products and disposal units for ALL bathrooms in every building on campus. By providing these resources PSU would be creating an inclusive, safe space for all people who menstruate including trans, non-binary and gender non-conforming students. The problems relating to houselessness in the Portland Metro area are an issue for students and marginalized populations living both on and off campus. Portland Menstrual Society works with local community organizations to collect and distribute menstrual hygiene supplies to individuals experiencing houselessness. Resources are delivered directly to camps, shelters and intentional communities through out the Portland Metro area by our community partners, Boots on the Ground PDX, Rose City Backpacks of Hope and Free Hot Soup. PMS is also a proud member of the Portland Houseless Support Coalition; a network of housing advocacy groups that work together to provide essentials to the houseless. NXT LVL is the official after party for Stand with Native Nations National Solidarity Gathering happening on Friday, March 10th. PDX Red Party is a fair-style event featuring dozens of vendors and influencers related to menstruation and health. We will have food, fun activities, samples of products and services, and a huge silent-auction style raffle. You won't want to miss it! This is a family-friendly event and everyone is invited as menstruation impacts our entire community. Our event aims to be as inclusive as possible so we welcome fellow community members regardless of shape, size, gender identity/expression, sexual orientation, race, ethnicity, or age. Smith Memorial Student Union Parkway North. My journey to menstrual advocacy started as a Community Development student while attending the Urban and Public Affairs undergraduate program at Portland State University. The school of Urban and Public Affairs is located in the Urban Center, one of the newer buildings on campus with exposed brick walls and long glass windows. This building has every amenity possible, except there are no pads or tampons in any of the restrooms. I was frustrated after a particularly heavy period that sent me home for the day from classes when access to a simple 25 cent tampon or pad would have addressed my situation. This led me to check out availability of supplies throughout the PSU campus, I was shocked to learn that there were ZERO machines dispensing this items and only some donated supplies available at two student centers. Otherwise students were advised to buy these products at the student store in Smith or at the Plaid Pantry on campus. This was not acceptable. To address these issues I started a chapter of a local nonprofit as a student organization in March 2016. My group began tabling at student events including Take Back the Night and Party in the Park at PSU. 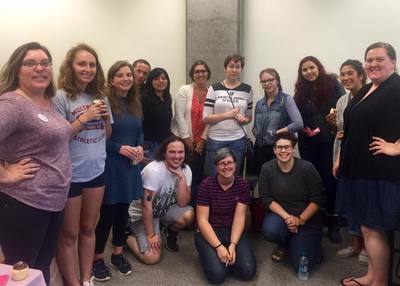 We invited students to join our organization in order to advocate for free menstrual products on campus, work toward breaking the stigma about periods and create an inclusive space for trans and gender nonconforming students to access supplies. We began by forging partnerships with the PSU WRC, collecting supplies in support of the center and making kits to provide students. The need was so large we couldn't keep kits on the shelves! This led us to expand our partnerships with other student resource centers including the PSU QRC, where we found that the students who needed it most such as trans and non-binary students, struggled not just with access to supplies but also bathroom safety. Inclusivity and access to resources have become the main missions behind the work that PMS performs on campus. We have expanded our partnerships to five student resource centers and are working everyday to collect supplies in order to have enough resources for every center on campus. We have begun an initiative with administration to have menstrual products in every rest room and are working on having this included in the student fees budget in the future. As the President of PMS, it has been my job to create and nurture relationships with faculty, administrators, students and resource centers to help them understand the importance of these supplies to creating an inclusive and safe space on campus. In my time as leader, I have helped to collect over 13,000 menstrual hygiene products for students on campus as well as the houseless population in Portland. I believe that with access to safe restrooms with free products for every student will eliminate one less worry for students to succeed in their academic journey. 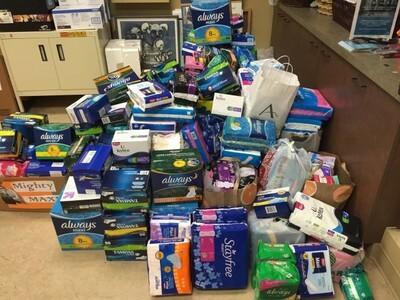 By creating this conversation on campus, PMS has already begun to break the stigma surrounding periods and has begun to build a movement of students in support of free hygiene products on campus. Students often approach me to rave about our presence on campus, and to say thank you for the kits we distribute. We are still working to reach all of the goals set forth for our organization but I would call what we have done so far a huge success! PMS is always in need of menstrual hygiene products, if you would like to donate. ​Please contact us on Facebook or via email! ​Weekly chapter meetings are held in the PSU WRC on Mondays from 11am-12pm. Programming board meetings are held every other Friday from 11am-1pm, check out our Facebook page for weekly location updates! Everyone is welcome! Bring your friends!